I was saddened when I glanced over at the angry mother who was scolding her son in the checkout line at the grocery store. I felt sorry for the frustrated mother but I mostly felt awful for her son. Perhaps he was making a poor choice in behaviour (I’m not even sure what he had done to warrant the scolding) but did he really deserve to be yelled at in public? And more so, did he really deserve to have all of his Christmas wishes threatened? 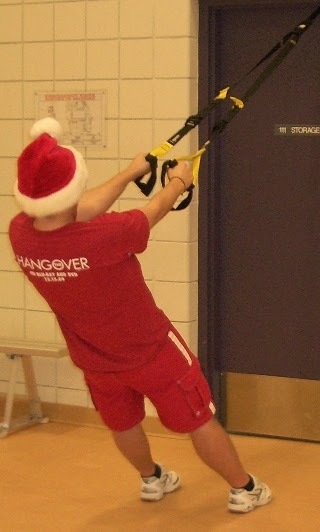 Even Santa likes to stay active! 1) What kind of messages are children receiving when they are led to believe they will only receive presents if they are ‘good’? Aren’t all kids inherently ‘good’? Why would anyone ever want to scare them into thinking otherwise? I think that kids deserve presents at Christmas simply because they are kids and it seems senseless to ruin that magic for them. 2) What are the chances that most parents follow through on their threat to ‘skip Christmas’ due to their child’s bad behaviour? Highly unlikely! Kids are therefore learning that their poor behaviour really has no consequence. For sure consequences can be an effective tool for teaching kids to make good choices, however, I think parents should choose more fitting and enforceable consequences. 3) What about the rest of the year? Santa’s visit (or potential lack of visit) may temporarily scare kids into compliance but shouldn’t we figure out a way to help kids to make good choices all the time? You may be wondering what the heck this has to do with health and fitness. Well, just like using Santa as leverage, I often see adults using extrinsic rewards as motivation to get kids to play sports. Parents or coaches may offer money to kids for scoring goals or candy if they try harder during practice time. Just like any other form of extrinsic motivation, these tactics often backfire. Do we really want kids to behave because of something as trivial as a fictitious jolly character in a red suit? Shouldn’t we be teaching them to be good citizens because it’s the ‘right thing to do’ or the ‘proper way to behave’ rather than dangling the external reward of presents in front of them in a shallow effort to get them to do what we want? By the same token, do we really want young kids to play sports because they are being rewarded with money or candy? Shouldn’t we simply allow them to discover that being active, learning new skills, and playing with friends is fun? As a health and fitness professional, my Christmas wish is for everyone (especially kids!) to be intrinsically motivated and to get out and play simply because they enjoy the feeling of being active. Stay active and enjoy a magical holiday season!